The Japanese entertainment industry is vastly different from the entertainment industry in America. Idol groups such as AKB48, Morning Musume, and Momiro Clover Z consist of girls trained to exert a kawaii, or cute, aesthetic and function as role models for the young people that support them. Japanese idols are becoming increasingly mainstream in the West, resulting in idols’ fan bases developing unique methods to support them. Wotagei the choreographed gestures and chants that wota, or fans of idols, perform at concerts, began in the 1970’s and has gained popularity in the 2000’s. The word comes from the combination of the words otaku, meaning someone with obsessive interests, and gei, which means performance or skill. Each song has certain points when the singer is not singing where wota are meant to shout something known as MIXes, which are often just a meaningless combination of words. There are also certain moves for every song that wota are expected to know before the concert. There are many YouTube channels dedicated to teaching these chants. According to Ricky Wilson, the manager of Necronomidol, an idol group formed in 2014, fanbases with incohesive wotagei may even be mocked on Twitter. The practice has become so mainstream that, in 2016, popular idol anime franchise The Idolm@ster released a wotagei virtual reality simulator for PS4. Wotagei culture has since spread to the United States as idol-themed anime, such as Love Live and Idolm@ster, has become more popular. The largest anime convention in North America, Anime Expo, invites popular idol groups, such as Aqours from the Love Live franchise, the Cinderella girls from the Idolm@ster franchise, and the Wake Up Girls! from the franchise of the same name, many of which are from idol anime. Even in Texas, the popular Texas Idol Festival promotes idol culture and hosts panels to teach American wota about wotagei at conventions across the state. Most American wota purchase Kingblades, the most popular brand of penlight, from Japan using Amazon, and more mainstream brands are looking to expand their market to America as well. 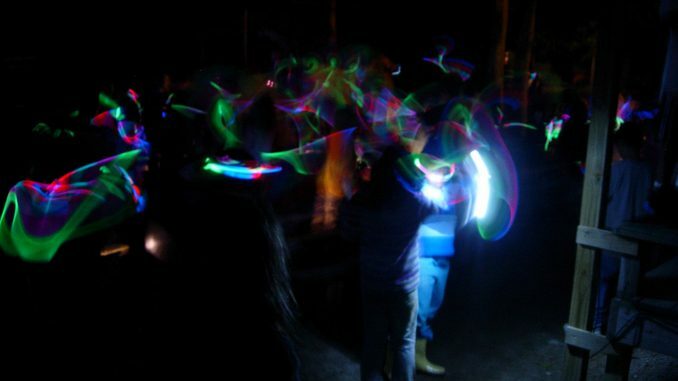 Wotagei use penlights, or battery-powered glow sticks that can change colors and are often decorated to support their favorite performer, to accentuate their wotagei. Japanese culture is increasingly becoming more popular in the United States, and wotagei culture is affecting how Americans consume Japanese culture. In 2017, the popular anime idol group, Aqours, broadcasted their Happy Party Train Tour at the Alamo Drafthouse, an independent American movie theater chain. The Drafthouse originally did not allow penlights at this showing but would allow glowsticks and crowd calls. After outcry over this policy from American wota, they decided to allow penlights. As American wota culture grows, it will be interesting to see how it will adapt to American social norms, and if a unique American brand of wotagei will emerge. Featured photo from Creative Commons.